The New York State vehicle safety inspection program helps make sure every vehicle registered in this state meets the minimum standards for safe operation on public streets and highways. In addition, most vehicles are subject to an emissions inspection to help reduce air pollution. A properly maintained vehicle is safer, performs better, uses fuel more efficiently and saves the owner money. You can help by doing your own equipment safety checks between annual inspections, and by following a program of regular vehicle maintenance as recommended by the manufacturer. Motor vehicles are required, by law, to be in safe operating condition whenever they are driven on a public street or roadway in New York State. 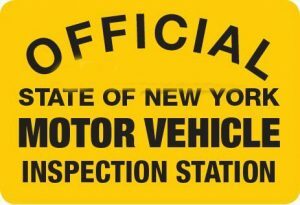 Each vehicle registered in New York State must be inspected at least every 12 months. The inspection must be done before the expiration date of the current inspection sticker, and whenever the vehicle becomes registered in a different name. At just Five Dollars NorthEast Ford offers prices lower than other Inspection Stations >>See DMV Fee Chart. We inspect everything from Light & Heavy Vehicles to Motorcycles all for the same low price.